Today's Milk Chocolate Caramel Sea Salt bar from Tony's Chocolonely (a Dutch confectionery company*) was uniformly sweet; however it contained enough variation in texture (caramel/toffee crunchy bits) and flavor (chocolate, salt) to create a good hedge against sweet overload. Something else that's sweet: The company has, from its inception worked to prevent child slavery in their cocoa supply chain. Previously only available in large size here, these smaller sized bars provide a convenient, more portable, single serving bar. 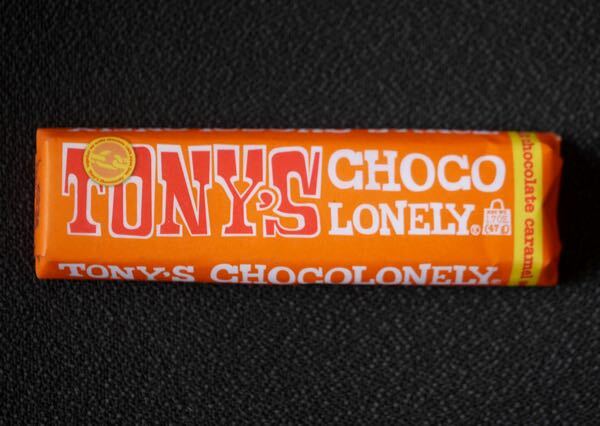 *Tony's Chocolonely is based in Amsterdam, The Netherlands. This bar was made in Belgium.